First Recording: December 14th, 1950 by Gene Autry & The Cass County Boys. Reached No 7 on the US Pop Singles Chart. And he on-ly paused a mo-ment when he heard him hol-ler stop! Song Key: B♭ Major - We will be using a capo on the 1st fret and play in the key of A Major. 80 bpm ( ) ... the beat sounds on every 1st & 3rd quarter-note / crotchet of each bar for those of you using a metronome or click track, with the value of each beat, a half note or minim as the symbol suggests. You can set the metronome at 160 bpm to play on every beat, but it sounds a little busy... the choice is yours. In the Intro, the xylophone comes in on the 4th beat of the first bar. There are 3 crotchet rests which indicate 3 beats of rest, then 2 eighth-notes / quavers on 4& (A, B♭) going into the second bar. The guitar starts on the second bar, although you can play the leading notes of A & B♭ on the 4& of the first bar if you wish... see chart. This song is very simple to play although there are a couple of barre chords, but don't be put off as they are very easy to play. The F#7 barre chord can be played like the E7 with the extra notes ... this is shown above in the written chords. | Bm - E | Play the Bm chord for 2 beats and the E chord for 2 beats. 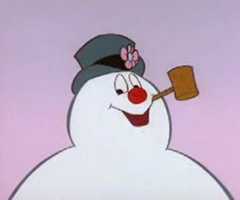 "Frosty The Snowman" chords and lyrics are provided for educational purposes and personal use only.